I've always had a weakness for Anna Sui's playful, decorative perfume bottle designs, and Romantica is no exception. It's an ombré pink creation with swirling floral motifs inspired by Art Nouveau design, with a gilt flower-bud cap that reminds me just a tiny bit of some vintage Lanvin Arpège bottles. The new fragrance inside, meanwhile, was developed by perfumer Steven DeMercado. Its "sparkling floral" composition features top notes of bergamot, mandarin, pomegranate and quince; heart notes of rose de Mai, osmanthus, jasmine, orange blossom, water lily and peony; and base notes of cedarwood, amber, sandalwood and musk. Romantica falls about midway along the spectrum of Anna Sui's floral scents to date: it has more heft than any of the brand's youth-targeted Secret Wish fragrances, for example, although it's nowhere near as vintage-y and enveloping as the original Anna Sui fragrance (now called "Classic") from 1999. It opens with plenty of sweet-and-tart fruit, mostly something like an orange-pomegranate hybrid. Strictly fruity perfumes don't hold my interest for long, so I'm happy to detect the floral heart of Romantica before long: a fresh peony, a peachy-smooth osmanthus, and a slightly chalky rose. The florals never completely dissipate, especially the peony, which is joined by a sheer yet tenacious wood-and-musk base. Romantica has good longevity overall, especially for an Eau de Toilette. To summarize: Romantica feels like a quintessential springtime fragrance. I've been a little confused by its autumn release here in New York, but then I realized that it's being launched in conjunction with New York Fashion Week, which is currently showcasing collections for Spring 2016. If you think of it in these terms, it makes total sense. I'll probably be gravitating more towards La Nuit de Bohème this fall, but when spring swings around again, Romantica will be a perfect fit for the weather and my mood — and my wardrobe. 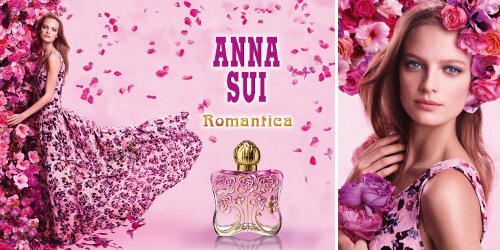 Anna Sui Romantica is available as 30 ml, 50 ml ($65) and 75 ml ($78) Eau de Toilette; right now in the US you can find it at Lord & Taylor and Nordstrom. I like the bottle, and I can suspend judgement about the notes until I smell it. The bottle is cute enough, I really hope I like it! It’s not a *radical* departure from some of the brand’s other florals, but I think it’s better-made and longer-lasting than some of the other, earlier pink-ish scents! You are so right about why this is launching now. fashion is always 3 to 6 months ahead of the season. That is why you can’t find your child snow pants in the middle of a Midwest winter. You will find them a bathing suit, however. It makes sense that designer fragrances would do the same. 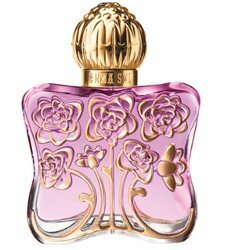 I haven’t had luck with Anna Sui fragrance, but that bottle is gorgeous. Of course, it’s a different season in other parts of the world! — so maybe it’s a perfect seasonal fit in other markets. The bottle really is pretty! Drives me crazy – by the time I figure out what I really need to add to my seasonal wardrobe, the season’s clothes are gone. Jessica, I’d been puzzling over why so many fragrances appear out of season – thanks for finally providing an answer. That’s a lovely bottle! BTW, I ordered the black with gold glitter Anna Sui nail polish you reviewed because I loved the bottle. The polish is great, too, but that was secondary. Well, it’s a guess, at least! I love those new AS nail polishes. It’s a fabulous color selection — so many pretty metallics and shimmers, in particular! I adore that bottle! The fragrance itself, like most of Anna Sui’s, sounds underwhelming, but I swear I might buy it just for the bottle. (And I never do that!) I think her original fragrance was amazing (and was another great bottle). I bought it when it first came out and still love it to this day, but unfortunately, most of her subsequent releases have smelled like some sort of weak fruity shampoo to me.